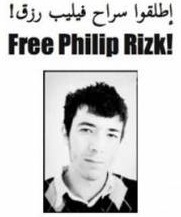 Egyptian authorities released the German-Egyptian blogger Philippe Rizk, on Wednesday after being held blind-fold for five days in an unknown place and subjected to all kinds of mental abuse. The police had carried out a raid on Rizk's house last Monday, searching it and demanding Rizk's father accompany them to his office. Plus confiscating three digital cameras, one video camera, a mobile phone, an IPod, thirty CDs and DVDs, a number of books and reference papers, personal documents, sixty camera films, a laptop case, a large travel bag, three hard drives and a handbag containing personal effects, according to Rizk. ANHRI also said that seizure of email passwords means that they are out of Philip's control and that therefore any message purportedly published by him, may not necessarily be genuine.